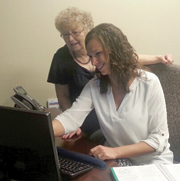 Julie Thompson of MediSYS (seated) reviews the coding with a client. In this provider’s case, it was Medicare’s annual wellness visits. When a patient first becomes active in Medicare Part B, they allow a Welcome to Medicare Visit, also called the Initial Preventive Physical Examination (IPPE). It must be performed within the first 12 months of the patient’s activation and is allowed only once in the patient’s lifetime. Using code G0402, it allows up to a $154.28 reimbursement. The exam covers much of what physicians are likely covering with their patients already. The provider must review the patient’s medical and social history, including their physical activity, tobacco use, and diet, plus review potential risk factors for depression and mood disorders, and functional ability. The exam portion covers some basics, such as visual acuity, height, weight, blood pressure, and BMI. Something included in these visits that’s perhaps not included in regular exams is end-of-life planning. Discussed only with the patient’s consent, this portion discusses life support and other sensitive healthcare decisions. Like with the Welcome visit, physicians can amend the regular office visit with the code for this exam, G0438, now reaping two office reimbursements in one time slot. The Initial Wellness Exam reimbursement runs to $159.02, a bit higher than the Welcome Visit. “It’s probably higher because of having to provide the five-year plan,” Thompson says. For every year after, physicians can perform the Subsequent Annual Wellness Visit. That code, G0439, equates to a $106.13 reimbursement. Thompson suggests setting up profiles in the practice’s EHR (electronic health records) for all three of the preventive exams to make sure physicians check off every requirement. And, if possible, add in alerts to physicians to code for other counseling sessions that regularly crop up in exams. “You can get payment if you’re doing tobacco cessation counseling,” Thompson says, adding that this isn’t just for Medicare, but many HMOs cover this too. If the physician spends three to ten minutes on the issue, a code G0436 results in a $13.50 reimbursement. That amount increases with more time, but practices must use the appropriate code for each time interval. “I think a lot of physicians do this, but didn’t know they could bill a separate code for it,” she says. A similar option holds for diabetes self-management training that lasts at least 30 minutes. “Many times, when you’re with a patient who has just been diagnosed with diabetes, you can code for G0108 and the reimbursement is $50.27,” Thompson says. Medicare and HMOs allow coverage for that code annually. On obesity counseling, the time requirement drops to 15 minutes, resulting in an allowable reimbursement amount of $24.60 under code G0447. “But they have to be BMI of 30 or higher. You can’t have a BMI of 29 and include this,” Thompson says. Other codes include an annual depression screening for 15 minutes under code G0444 for a $16.44 reimbursement. 15 minutes on cardiovascular health (intense behavioral counseling therapy to reduce cardiovascular disease) nets a $24.60 reimbursement. Counseling to prevent sexually transmitted infections for at least 20 minutes results in a $25.55 reimbursement. Only a primary care physician or practitioner can perform most of these exams, leaving practices such as urgent care or specialists, like ENTs, exempt. “Primary care physicians need these extra incentives, because they’re seeing a heavier patient load and not seeing the revenue from procedure incentives of the specialists.